I’m always glad when February ends and March begins because I foolishly like to think March = Spring. All hard feelings aside, February was actually a pretty good month though. The beginning of the month brought my favorite holiday: Groundhog’s Day. Life has been pretty busy (all good things of our choosing) so I actually kept forgetting it was coming up. 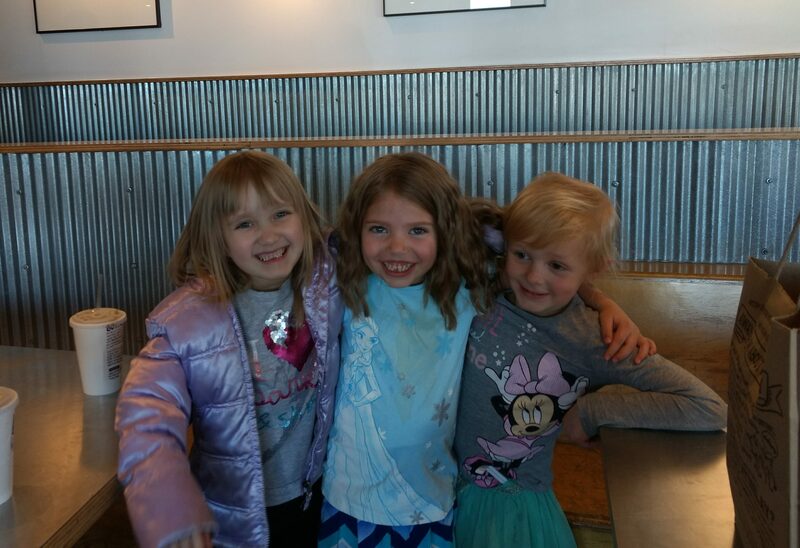 The kids were so excited though and kindly reminded me to make plans. 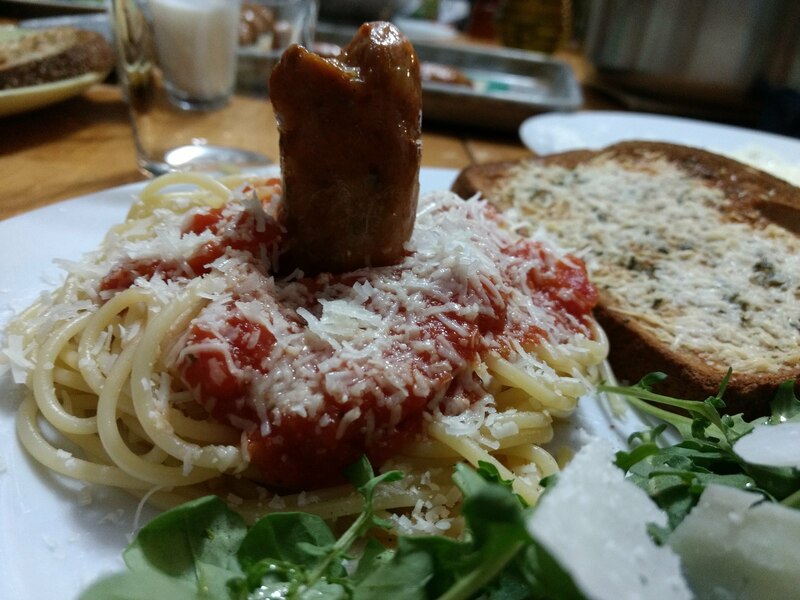 We celebrated by putting up our groundhog day flag and having “groundhog sausages” that stuck out of their pasta burrows. Noel has a co-worker who owns several apartments. He has a connection with someone at a local unnamed home improvement store and got a bulk discount on all their ding and dent refrigerators. His whole garage and living room were full of refrigerators and his wife was a little anxious to get rid of some of them. We took one off their hands for a good price. 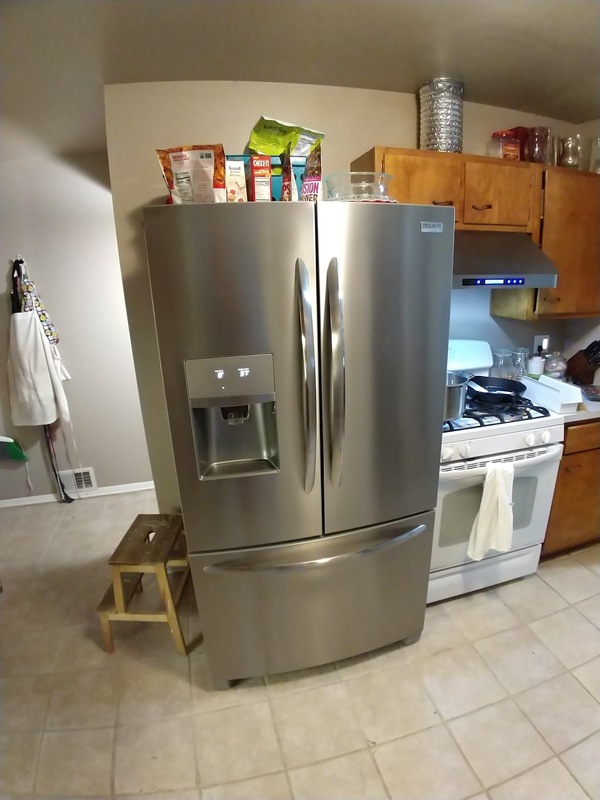 Now we have a shiny new fridge. 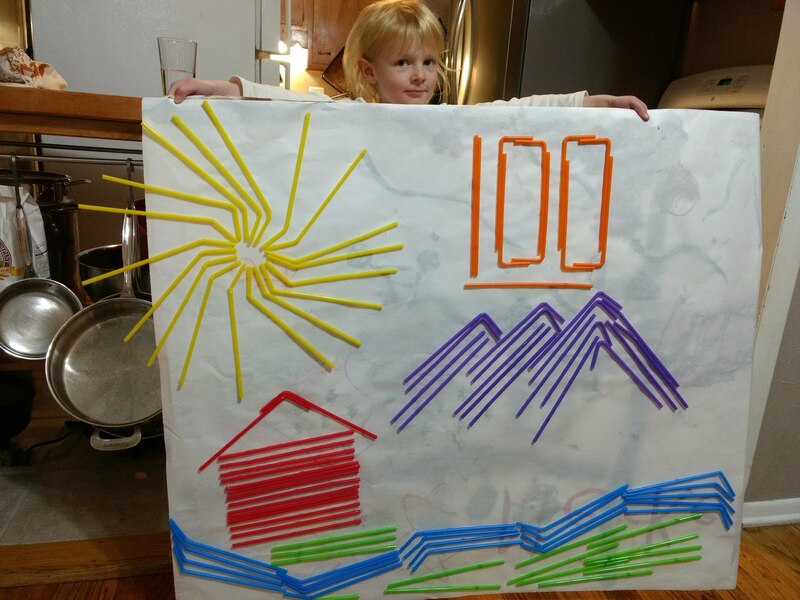 Ellen celebrated her 100th day of school. She had to bring a project made out of 100 objects. She choose straws. Art credit goes to me. This is the cute picture I sent my brother Mitchell on his birthday. They said they were making a heart for him. Waiting for the symphony to start. Our view from the cheap seats. Noel and I set a goal to go on a date every month this year. In February we went to the symphony. It was a John Williams night, which I knew Noel would especially love. Noel wasn’t feeling great, but it was going to take more than nausea to keep him home. (Some nausea meds we had leftover from caring for his mom also helped.) Our seats were cheap and right behind the musicians, but it was actually kind of a fun perspective. It was also a really cold night with freezing fog which made downtown pretty sparse. Heart Breakfast with cherry limeade smoothie. The kids were so excited about Valentine’s Day you would have thought it was Christmas. In the morning we had plenty of heart shaped food. Cooper dressed himself in a dapper outfit – tie and everything. He said, “This is how you dress on Valentine’s Day.” Ellen, who says her name is Ellen Fancy Nancy Merket, pretty much always dresses this way. Ellen checking out her Valentine’s Day. Cooper passing out Valentine’s Day. Cooper checking out his Valentine’s. I helped at Cooper’ class party and was able to slip into Ellen’s for a few minutes. They all enjoyed their hoard of candy immensely. We went on a quick trip to Moab over President’s Day weekend. It was nice to spend a few days in the desert. We used a family connection to stay in a hotel, so we enjoyed the desert by day and the hot tub and Olympics by night. Red rocks and snowcapped mountains. Ellen and a gnarly tree. Climbing out of the canyon. Ellen looking out across her kingdom. On day one, we went to the Needles district of Canyonlands. 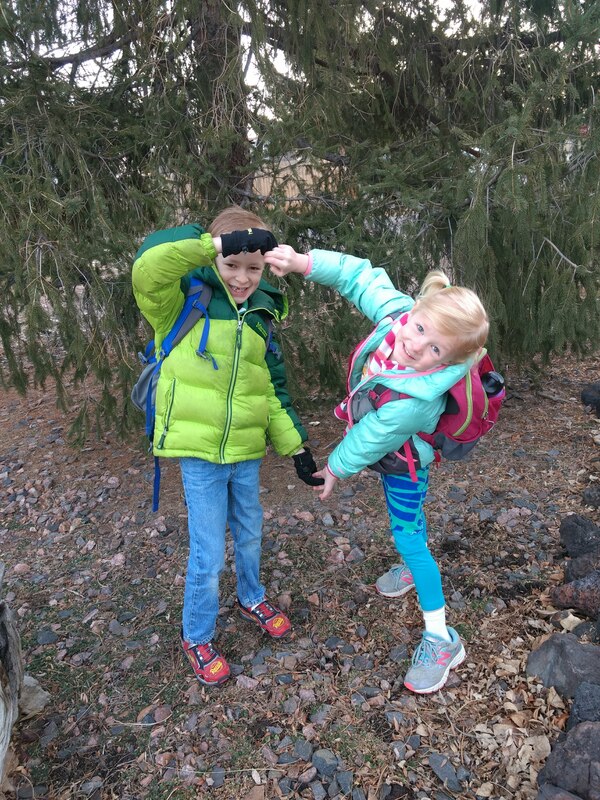 The kids did a 7.8 mile hike through Squaw and Big Spring Canyon. Their impressive hiking skills are making it possible to do less traveled hikes. Outside of the first and last half mile of the trail, we only ran into one other group. The kids do best when the terrain is interesting, so they loved the parts where we were scrambling up red rock. We were going to head home Monday, but cut our trip short because both of the kids had bad coughs that were keeping everyone up at night, plus it was supposed to snow Monday. 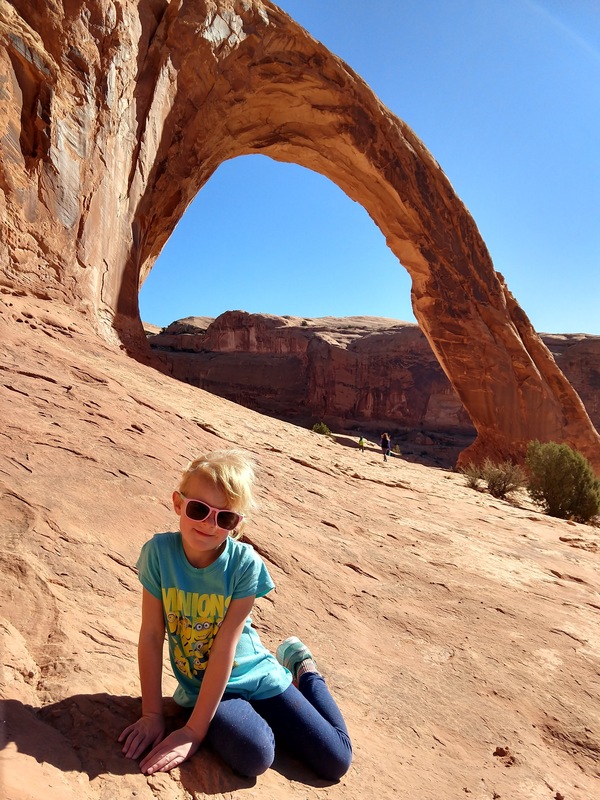 Before heading out Sunday, we checked out Corona Arch. It was a hike we’d never been on and wasn’t terribly long. Cooper and I at Corona Arch. 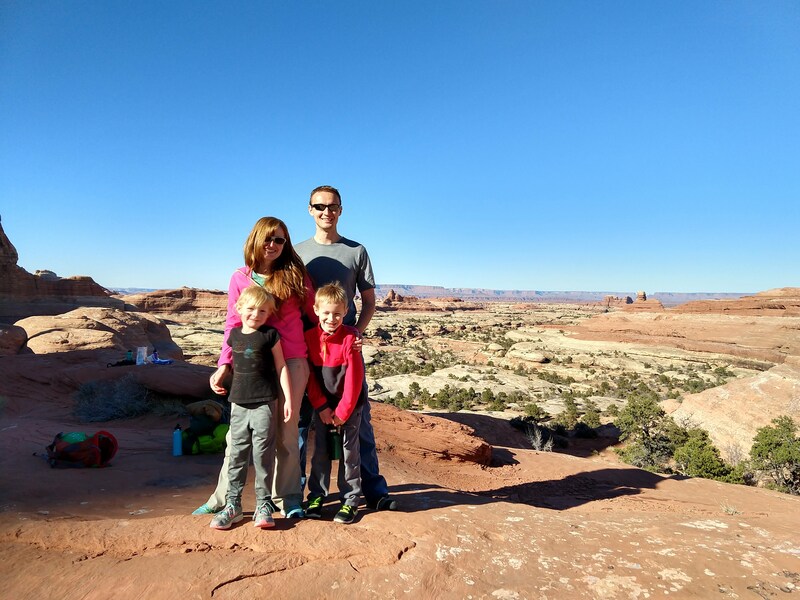 The whole family in front of Corona Arch. It was a nice, but quick getaway. The next day it did indeed snow, a lot, and we were very glad we were home with nowhere to go. As I mentioned in my last post, the 25th was the one year anniversary of Glenna’s passing. 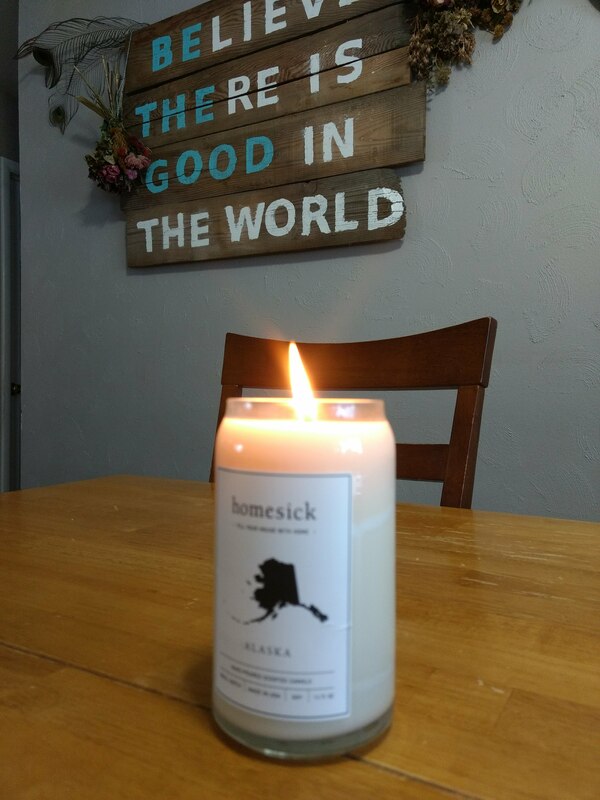 We memorialized it by lighting her Alaska candle and talking about some of our memories of her. 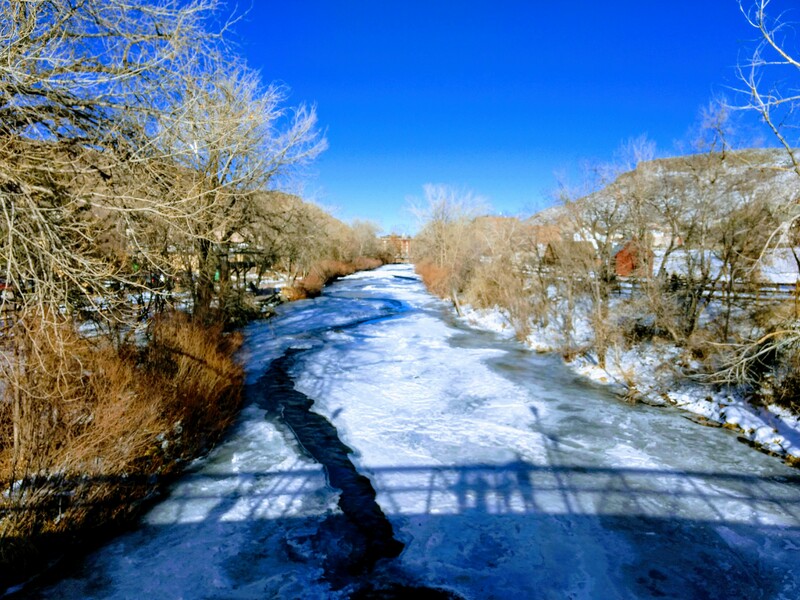 We also went on a walk and threw some rocks in Clear Creek, which was something she’d borrowed from Rosh Hashanah, but often did year round. It was a reflective, but peaceful day for our family. I love the heart hair! I need to work on festive hairstyles like that. Does Ellen go to half-day kindergarten? I think that’s awesome. Our school in Seattle offered it (because you were supposed to pay for full day, or you could attend half day for free–at public school, thanks), but I wished that there was a separate half-day classroom instead of just a couple kids who leave at lunch time–it sounds like that’s how it is for Ellen’s school too. Yes, Ellen is in half day kindergarten. Ours sounds like the same as your situation in Seattle. Kids can go full day here for $300/month. Most of the parents choose that option. They used to have a dedicated half day classroom, but the full day option has become so popular that half day has been part of a full day class since both of my kids started school.